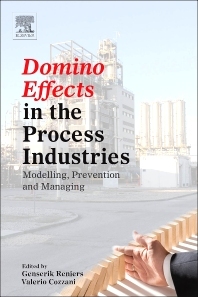 Domino Effects in the Process Industries discusses state-of-the-art theories, conceptual models, insights and practical issues surrounding large-scale knock-on accidents—so-called domino effects—in the chemical and process industries. The book treats such extremely low-frequency phenomena from a technological perspective, studying possible causes and introducing several approaches to assess and control the risks of these scenarios. The authors also examine these events from a managerial viewpoint, discussing single and multi-plant management insights and requirements to take pro-active measures to prevent such events. Academics, regulators, and industrialists who study and analyze domino effects in order to prevent such events will find the book unique and highly valuable. Top- and line management within industrial sectors handling or storing hazardous substances, chemical engineers, bio-chemical engineers, environmental managers, safety and prevention managers, research centers on industrial safety and academic researchers. Valerio Cozzani (1968) received his Ph.D. in Chemical Engineering from the University of Pisa (Italy) in 1996. During the Ph.D. he spent an year at the Industrial Hazard Unit (IPSC) of the Ispra European Community Joint Research Centre. After the Ph.D. he joined the National Research Group on Chemical and Environmental Risk of the Italian National Council of Research. Formerly lecturer at the University of Pisa, he is now professor at the Department of Civil, Chemical, Environmental and Materials Engineering of Bologna University, where he leads the Laboratory on Industrial Safety and Environmental Sustainability. He is Director of the academic graduate and undergraduate programs in Chemical Engineering an lectures on unit operations, design, loss prevention and risk assessment. He coordinated several joint university-industry training projects. His main research experience is in the field of safety of chemical processes and of environmental and energy technologies. The specific subjects afforded in his research activity are, among others, the development of innovative methodologies and models for hazard and risk analysis, the development of models for equipment damage and the implementation of procedures for the quantitative assessment of accidental scenarios triggered by external hazard factors. He has a wide experience in leading national and international research projects funded either by public organizations or by private companies. He coordinates the Italian working party on safety in the chemical and process industry (CISAP) and is Member of the Working Party of Loss Prevention (EFCE). He received the Trevor Kletz Merit Award 2015 for outstanding contributions to the field of Process Safety. He serves as Associate Editor of Safety Science and is a member of the Editorial Boards of the Journal of Hazardous Materials and of the Journal of Loss Prevention in the Process Industry.